What for? 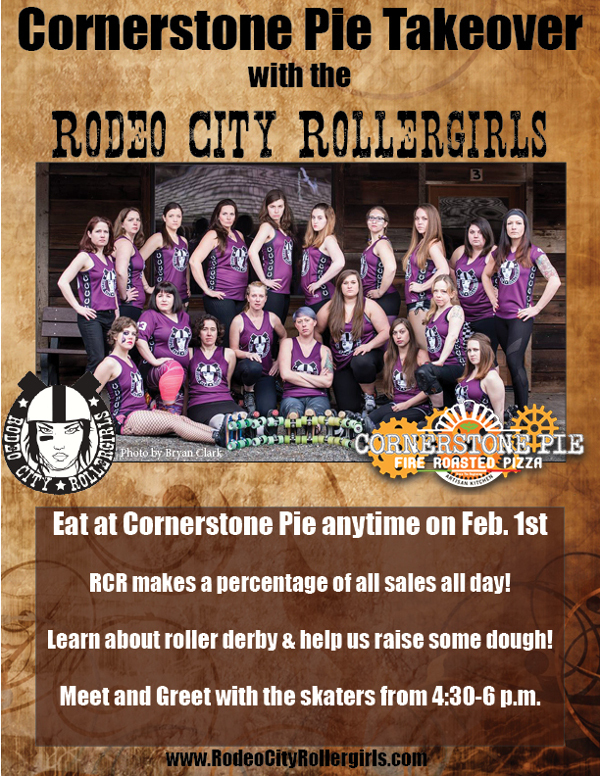 The Rodeo City Rollergirls will take over Cornerstone Pie from open to close Feb. 1st to raise money for our team and promote awareness about roller derby. What else? Stop by Cornerstone Pie throughout the day for a salad, appetizers, beer and pizza. RCR will take home a portion of the proceeds at the end of the day. Come enjoy lunch, dinner (or both), beverages and great company! The Rodeo City Rollergirls hold fundraising events throughout the year to raise money to pay for our gym rental at the high school and other track expenses. Your assistance with this fundraiser is greatly appreciated. You + Food = RCR continuing to skate! This is a family friendly fundraiser. We hope to see you and your friends at Cornerstone Pie!